The redtail catfish (Phractocephalus hemioliopterus), known as the cajaro in Venezuela, and the pirarara in Brazil, is an extremely large freshwater fish. Yet, despite its total lack of suitability for home aquariums, it is still regularly found for sale in pet stores. Its name originates from its distinctive reddish dorsal and caudal fins. These fish have a wide distribution in South America, and occur throughout much of the Amazon and Rio Orinoco basins. They are found in Venezuela, Guyana, Ecuador, Peru, Bolivia, Brazil, and Columbia. Redtail catfish inhabit everything from large rivers to streams, and are found in flooded areas, rapids, lagoons and lakes. They thrive in a broad range of habitats, and this ability has allowed them to become an invasive species in numerous countries, most notably in Thailand. It may also have become established in the United States, as specimens have been found from Florida to Nebraska (though they can’t survive in cold climates). Redtail catfish can easily reach lengths greater than 48 inches (122 centimeters) in the home aquarium, and they grow even larger in nature. The largest recorded caught redtail catfish was 123 lb 7 oz. (56 kg), and 63 inches (160 centimeters) in length. They can live up to 20 years in captivity, though their lifespan is usually far shorter, since they are rarely given the conditions required to keep them healthy. Unless an individual happens to work for one of the major aquariums, it is unlikely they would be able to provide a suitable fish tank for a redtail catfish. 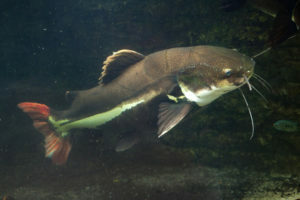 For an example of how large these fish grow, many of the more common ‘tank-buster’ fish can easily be consumed by a full-grown redtail catfish. 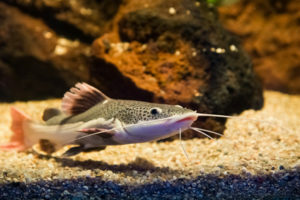 The absolute minimum tank size for an adult redtail catfish is 1000 gallons (3785 liters), and even that could be considered too small as it would still restrict their swimming. Any tank large enough for these fish would likely resemble a small indoor swimming pool, and would take an immense amount of work to maintain. However, if someone is able to house a redtail catfish, they can live quite happily in a sparsely finished fish tank. They don’t require ornaments or live plants, and in fact, adult fish are notorious for swallowing ornaments – often leading to health problems. But, if any ornaments of decorations are added, they must be heavy enough to prevent them from being moved. The best decorations for a redtail catfish aquarium are large pieces of driftwood, which juveniles in particular enjoy hiding behind. The lighting should be kept dim for these fish, as they are a bottom dwelling species, and prefer low lighting. Generally speaking, the only truly safe substrate for them is sand, as gravel or even river rocks will often be swallowed and can make them ill. A bare bottom tank is also an option, and has the added benefit of making it easier to clean. Redtail catfish tanks are simply too large for traditional filters, and a sump filter is the only realistic option. They can be purchased, or constructed as a DIY project, since the commercial sump pumps are often very expensive. Overfeeding tends to be a real concern with these fish, and they can become sick – or even die – if they are overfed. Juveniles should be fed every other day, and adults only need to be fed once or twice a week. In the wild, they consume a wide variety of foods, including plant matter, fruits, fish, and invertebrates. This should be replicated as closely as possible in captivity, and they will happily accept fish filets (salt-water fish only to avoid parasites and diseases), earthworms, and marine shellfish like mussels and shrimp. Feeder fish should be avoided, unless a safe source can be found, or if a person breeds the feeder fish themselves. Most of the feeder fish found at pet stores are riddled with diseases and parasites, and will likely transmit them when placed in the same tank as these fish. Currently, there are no reports of these fish being bred in captivity, and its doubtful more than a handful of tanks large enough exist in private hands to even attempt breeding. Most breeders even report difficulty breeding them in large ponds. I’ve got breading pair of huge redtail catfish and hybrid shovel nose cat fish in my 6foot tank. Can anyone advice me what i could do to bread them. I’ve had them for a long time and now they are even more intimate bonding then b4. Can anyone advice me plz.